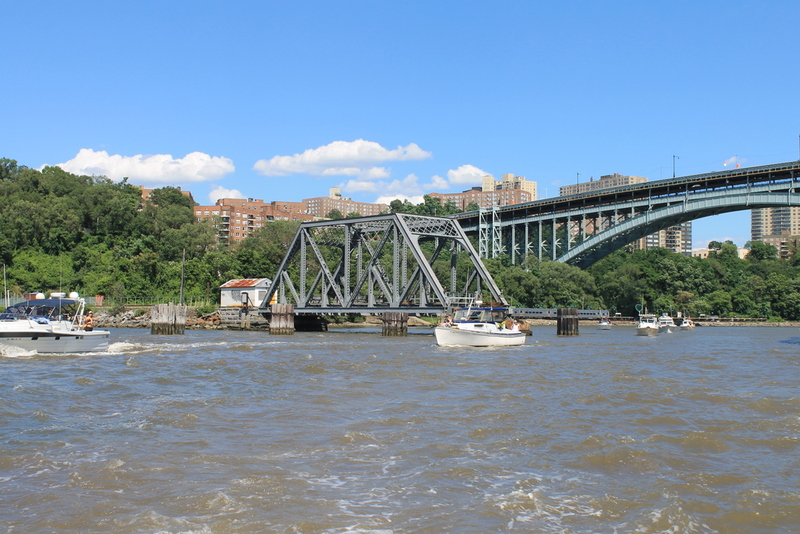 With the swing west across Spuyten Duyvil the river changed again. The breeze I hadn’t previously noticed was now coming directly head-on and the water got choppy. Not a big chop but after four or so hours, one notices it. I had no idea how much time had elapsed, but asking wouldn’t make it go quicker, and I might discover less time had passed than I’d hoped, a no-win situation. In retrospect it was a quick section of river, though it didn’t particularly feel it. 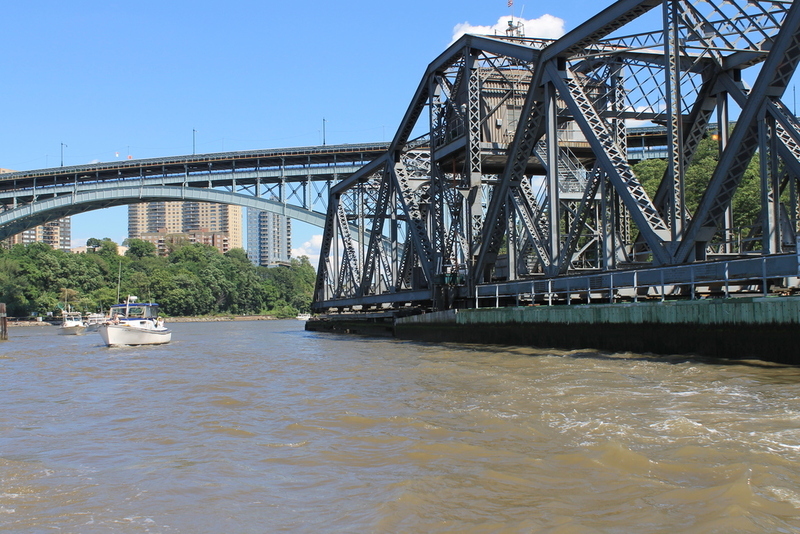 I was waiting for the very low railway swing bridge that I knew was at the northwest tip of Manhattan to appear traffic started to get really busy. The bridge was turned and blocking the river traffic, Brian and I would continue under, where there was less than two metres of clearance, and south-west into the wide Hudson river. I had developed pain, but not a shoulder or muscular pain. Instead it was a growing pain in my stomach. I was aware that I’d continued to urinate, but not at my normal swimming frequency, when I’m usually pretty regular at about fifteen minutes, or to be precise, twice on a Sandycove lap. I still had intermittent minor cramps in my feet, but I taken every drop of every feed, and didn’t think we needed to increase the volume. At the previous feed around Spuyten Duyvil the discomfort had reached such a level that I didn’t finish it, taking only about 150 mls. 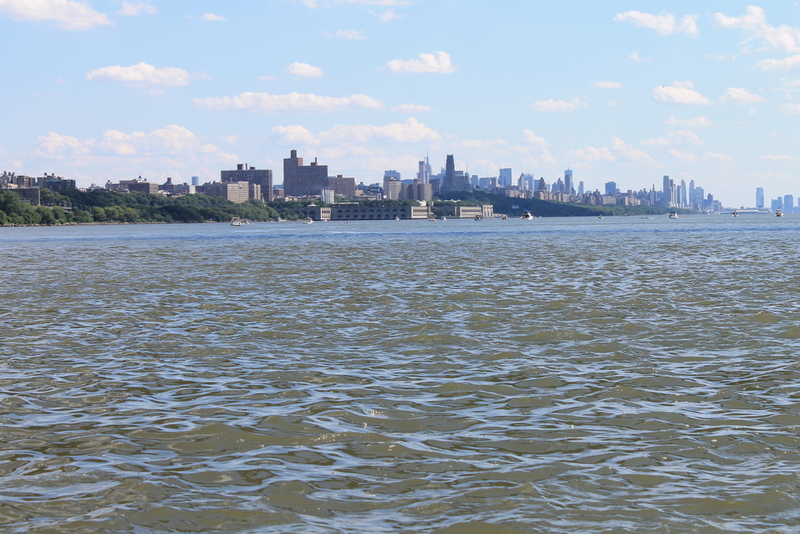 And as we swung out around into the Hudson aiming (as advised in the swimmer briefing) for the leftmost pillar of the George Washington Bridge rather than following the coast, all the held boats came roaring out after me, wave after wave after wave for an interminable ten minutes. 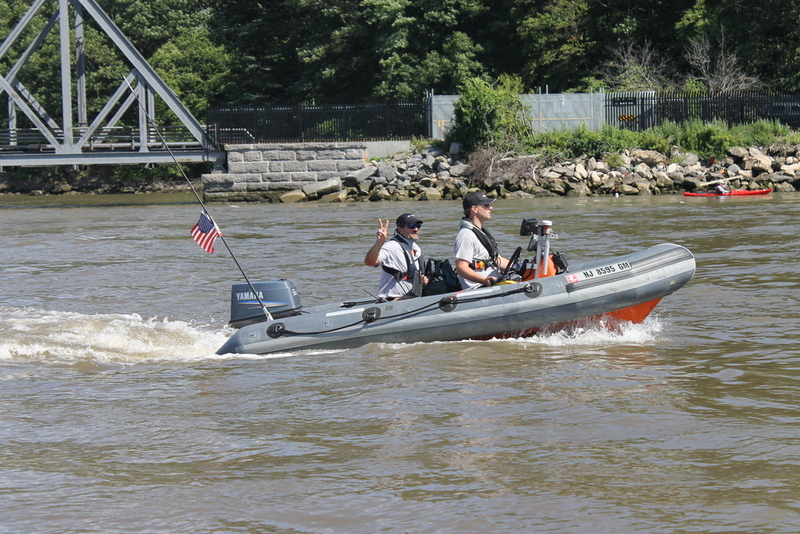 Fastest Triple Crown record holder Dave Barra entering the Hudson – Peace! And then another feed, by which time Reel Passion had caught up. I refused that feed. For me this was a significant but very conscious decision, I’ve trained over the years to always take my feeds. But my stomach was bloating and I was now in considerable discomfort, still urinating but feeling no relief. Missing a feed is not a decision taken lightly, but I decided I need to let my stomach clear further. I knew (though not with the certainty you’d imagine on dry land) that missing one twenty feed interval wouldn’t leave me unable to swim. About fifteen or so minutes later, after I’d tried and as always failed, to count strokes to figure elapsed time, I felt I could tackle the feed. Co-incidentally for those few minutes Brian was ahead of me, Reel Passion was behind and outside. I tried to swim to Brian but he stayed fractionally ahead of me so I shouted his name, the first sound I’d made. He stopped, I fed. My swimming and the pain in my gut resumed. 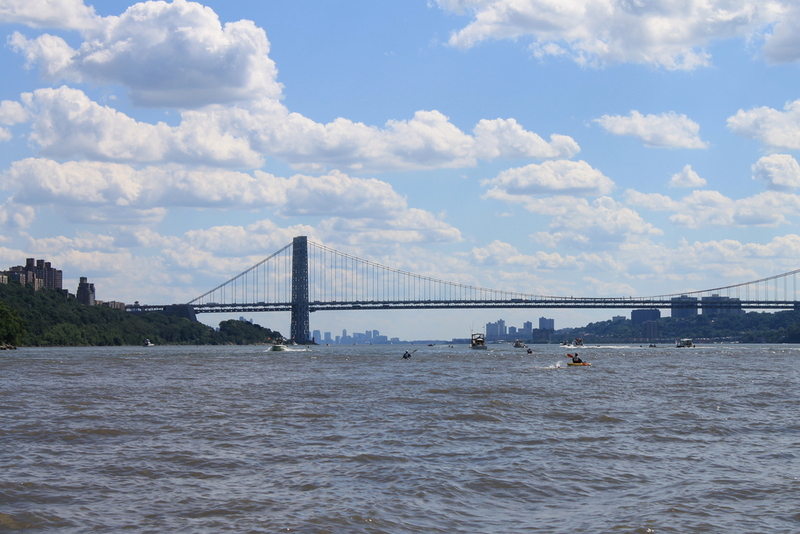 The George Washington bridge was still ahead, bisecting the world-sky like Bifrost, the Bridge of the Gods, my target estimate all along was that I should assume an hour to swim from the turn into the Hudson to under its arches. Think of a Wolf. Not any wolf. A Wolf. Yellow eyes, black fur, lips curled back from snarling jaws. Now don’t think of the Wolf. Eliminate it completely from your mind so that you don’t know you were thinking of the Wolf. But think of the Wolf’s belly. Now, don’t think of the Wolf’s belly, that black sack. Think instead of the Wolf’s consuming hunger. This is distance swimming. Another book comes up from the recesses, this time not an assistance. Not thinking of the hunger in the belly of the Wolf was the ongoing stomach pain. It’s an overwrought metaphor, but the one that visited me and stayed quite a while in the Hudson river. Don’t mistake my intent: this was not English Channel level of difficulty. But this was a tougher swim than I’d expected and this was the important part and this is how it felt for this part of this swim. Next time, it will feel different, next time I’ll try to find a different way of explaining it. Of all the aspects of swimming that I know and I’ve written about, I’m aware of omissions, some conscious and deliberate, some because I still struggle to convey what I intend. And because I think too much sometimes, according to my friends. Swim your own swim. I’d said it to swimmers in Sandycove only the previous week during the qualification swims at the end of Distance Week when I was helping on the island. I’m sure other swimmers say it. Swim your own swim. Put aside the external factors of other swimmers going better, faster, stronger or tougher than us. Find the nowness and swim through that. And then swim through the next bit. And on, and on through the glacial slowness of it all. I reached the George Washington bridge with an internal wolf, the bridge taller longer and more massive any previous bridge, the chop from across the wide river increasing. Odin’s rainbow bridge spanning the sky and worlds, swimming under its huge height. Another feed, and as I gave the bottle back, my right thigh cramped hard, another sign of dehydration. I punched it and resumed swimming. 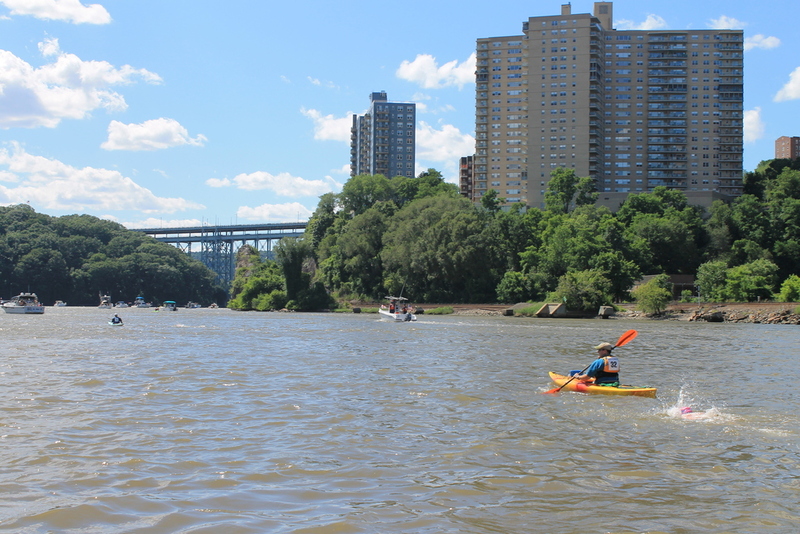 Almost immediately two kayaks and swimmers passed flanking me to east and west, moving like they were last-wave seeded swimmers, who would have all passed me long previously in the very low reaches of the East River and Lower Manhattan. I was not amused. I couldn’t risk increasing my stroke rate so far out. Swim your own swim, put it out of your mind, swim on. The west bank of Manhattan Island slid past and we were well out, maybe three hundred metres, far enough to feel invisible, my preferred place out the water, out deep, out far. I saw a building like a giant Battenberg cake, others that reminded me of the Planet of the Apes town (the original mind you). I still occasionally checked behind me while feeding. 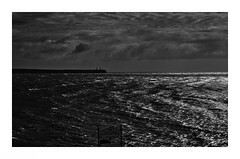 Ciarán was not visible but I was low in the water, surrounded by chop, no great distance vision to select targets, no time to look and figure anything out. Captain Joe shouted encouragement. Brian was positive, Dee gave me thumbs up. I saw a spire and a hint, very low in the distance, of the Emerald City. The spire grew to a church steeple and slowly I swam past it. The chop was now constant and often large. Captain Joe moved the boat around behind me a few times for short durations to my left hand side to partially protect me from large bow waves of the rushing navy and white-coloured East River Ferries. But the waves were mainly coming from my primary right-hand breathing side. Soon afterwards, Brian told me I was at 122nd Street, to which I responded that meant nothing to me. Really, I didn’t know how far up that was. After the church spire I noticed an increasing amount of berthed boats, which meant while looking during feeds I couldn’t tell which were moored and which were the race boats. I saw one boat I recognised from swimming near it for hours in the East and Harlem rivers, Get Over It, or something similar. Not once during the swim did I equate the name with anything meaningful or useful. The pain in my stomach continued, what more is there to say, I continued to feed, I began to realise the stomach pain wouldn’t stop me at this stage. We swam slowly past Uptown and Midtown, the Empire State again, with the Chrysler barely peeking up briefly from the far side of the island this time. Piers passed, counting slowly down. I’d see Pier 112 expect and hope to see pier 102 the next time I saw a pier number, but only four would have passed. Then the number would unexpectedly drop six, always even. 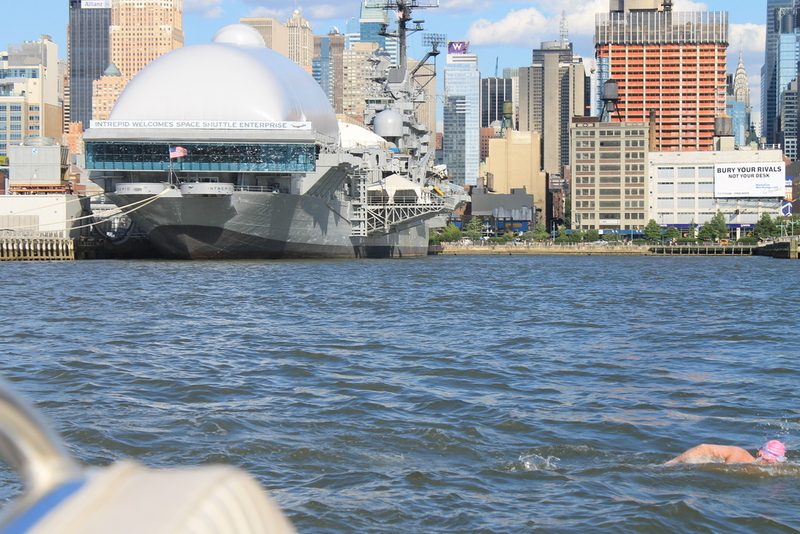 We moved out for the Intrepid’s Security Zone. Couldn’t say how far we had to go, as always with swims and these parts, the time itself was interminable in swimming, and short in recounting, “long in the living, short in the telling”. There was a Department of Marine and Aviation pier that took forever and was probably only a couple of minutes to pass. Tower One was a growing beacon, reeling me in. Another glance showed me the low towers has grown large and separated. I’d been seeing both the World’s Capital and New Jersey’s towers. This heartened me greatly as I guessed the Emerald City spires were closer than Jersey. I was wrong as it turned out. At a feed Captain Joe shouted out happily that all was going well. I saw Tower One again and now I was starting to look upwards at it as it started to really pierce the sky. I passed very close under a pier with people on the edge above me. I waved momentarily as my left arm was recovering but no-one waved back, all staring down onto me. I paused and roared out “wave back you fuckers”. Some waved back. Out on Reel Passion Dee thought someone had abused me, not realising it was the other way around. Irish stereotype abroad. I was in a good mood. Anther feed and Brian said the Magic Words, “this is probably your last feed”. “Really?” I said. “Yes”. What did probably mean? I asked myself. Captain Joe and Dee were there. “Swim to the orange buoys, the orange buoys”. I looked and saw the orange buoys. I didn’t notice Brian leaving as he had to go into North Cove to drop off his kayak. I gunned it, hammer down for about 1500 or 1800 metres, the swimmer’s mile, a lap of Sandycove, home free and unstoppable, the measure scribed deep into distance swimmers as our gauge of the world. Where pool swimmers stop counting up, we start. Marathon swimmers own watery distance in the way sailors own the wind. Angling into the Battery Park wall, breathing mostly on the right as I pushed to the maximum, occasional breaths left to stay constant from the sea wall and to see the people, legs beating hard, all thoughts of camp and pain evaporated, kayakers paddling upstream against me, people on the sea wall, the only sound still my breathing in the water. And then the buoys were there, I rounded the wall, and that was it, the steps were there. There were two people on the ladder which was moving up and down significantly. They reached out to grab me and I roared again “Don’t touch me”! I hadn’t realised MIMS was a water start AND finish, requiring me only to touch. 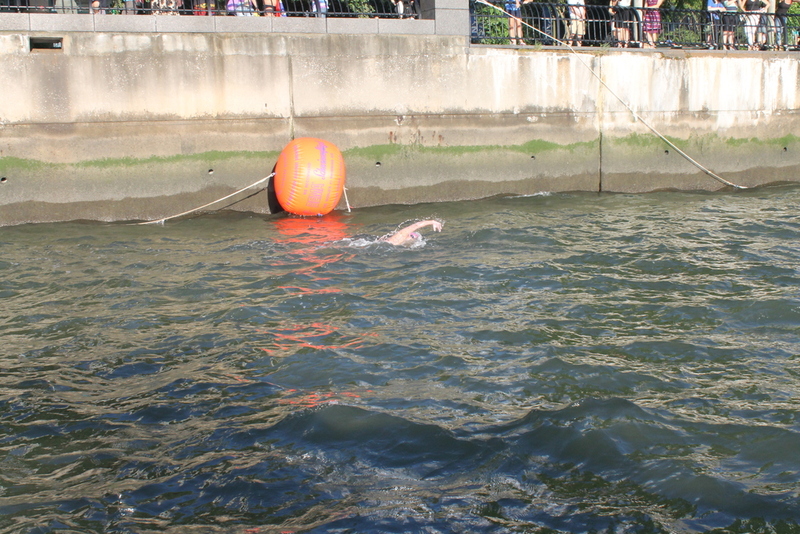 I’m a Channel swimmer, I get out of the water unaided, it is fundamental to how I see swimming. Any touch is against Channel rules and I swim Channel rules. They shouted again, “You MUST touch for a finish”. This was not covered in the briefing. I touched hands, separated, and hauled myself out and up the pontoon. “What do you want?” they asked, or words similar. “I’m going to swim back out to the boat to say thanks”. I slipped my goggles back, jumped very ungainly into water, the goggs slipped off, I re-adjusted and swam across the Cove toward Captain Joe, Dee and Observer Shi Ling. They were moving away and shouting at me to go back so I stopped, roared my thanks, and swam back, having apparently caused a mini-furore in South Cove. Arguing about the finish! Bloody Irish. I climbed the piling, up the slipway, got a rinse off from a hose, and waited. I felt great, no swaying, no soreness, no tiredness. I went around the Pier Wall to look up the Hudson and there were Ciarán and George coming toward me. Down for their exit at the pontoon. 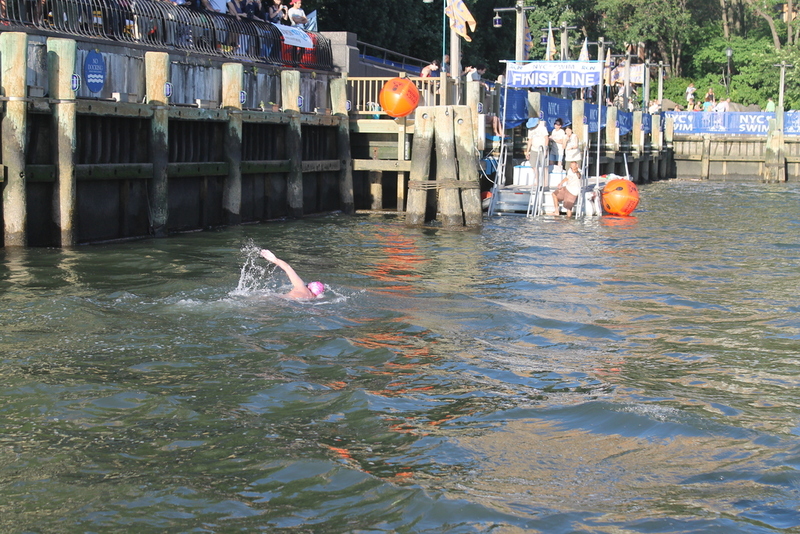 Manly swimmer hugs as usual on the slipway. We were all done. Shortly afterwards we discussed the swim. Ciarán and George found it equally tough, we all experienced difficulties in the same places, the lower East River, Spuytin Duvyil, the mid and lower Hudson. All three of my crew did an fantastic job in communication, navigation and protection but Dee carried the burden of worrying that she would somehow ruin the swim, and went into it with fantastic preparation, and always watching me. My first stroke rate count when Dee saw me before the first feed was 76 strokes per minute. I’d assumed with changes I’d made to my stroke over the past year that my rate would be a little lower but it was 71 stroke per minutes thereafter until the end, one stroke per minute higher than the English Channel, consistent enough to be measured. The significant stomach pain I’d had was invisible to the crew, and Dee said I’d never wavered and that I looked completely in control. 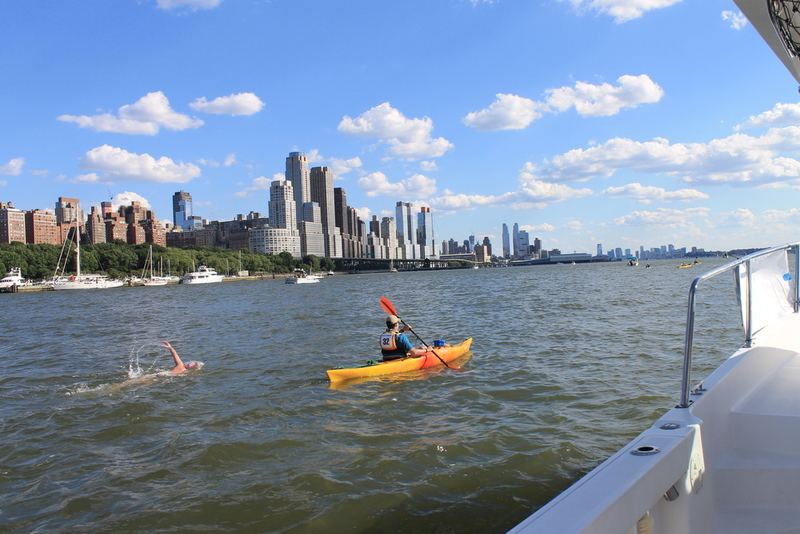 She also said I passed the two swimmers who’d flanked my under the George Washington Bridge which I ascribe (possibly erroneously) to the time I’ve spent in rough water. My nick-names for landmarks (which Dee made me take out of the writeups!) around Manhattan are how I will always think of them from now and Lower Manhattan will always be the Emerald City for me … though the road there was more murky-green than yellow. p.s. 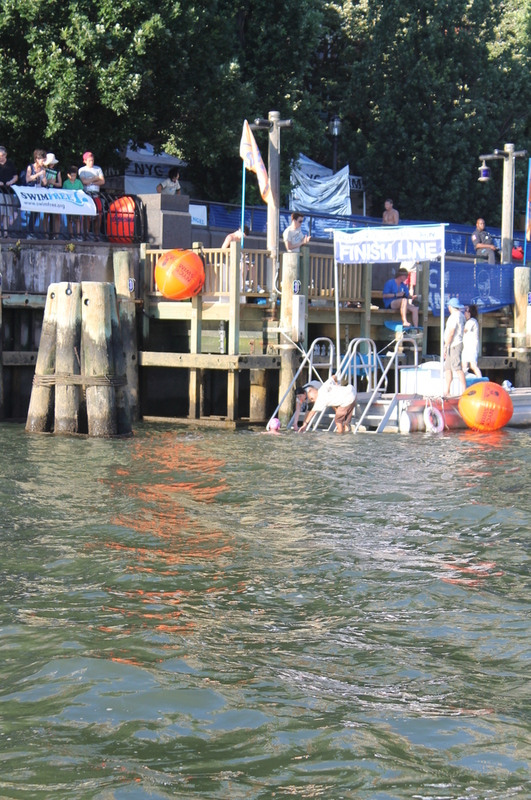 Water temperatures measured during the swim were from 76° to 78.5° F. Air temperatures were 87° to 89°F. My time was eight hours thirty-two minutes, finishing in 22nd place from start number 32. Thanks to Captain Joe and kayaker Brian for their guidance (literally) and keep me safe and Shi-Ling for keeping an eye on everyone. I’d love to see her pictures. Thanks to Dee for being such great crew…and for her fab pictures! Best of luck Lynn, I’m sure it’ll go well for you. Enjoy the view! Wonderful photos and it looks like you had a great time. beautiful. both deed & description.